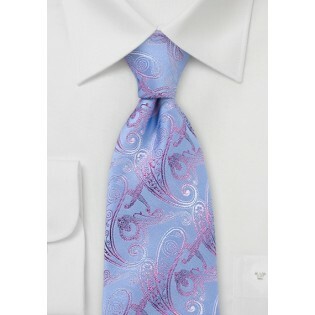 The modern paisley print is handwoven into the sky blue background creating a stunning and vibrant tie. This tie is a spring and summer tie. This is a contemporary paisley statement that belongs in every man’s wardrobe. 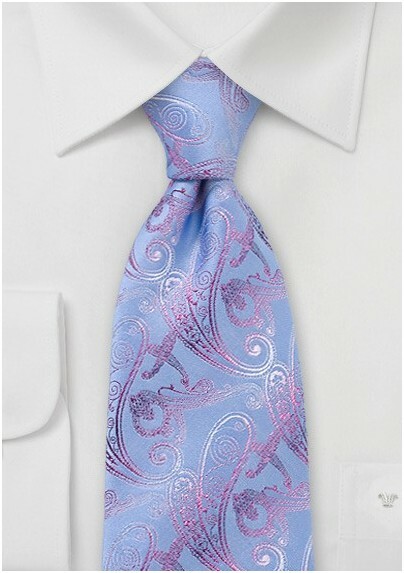 Pair this tie with a shirt in light pink or white to emphasize the subtle pink paisley. Match this combination with a light gray, or navy blue suit and your are sure to have a sophisticated and fashionable look.